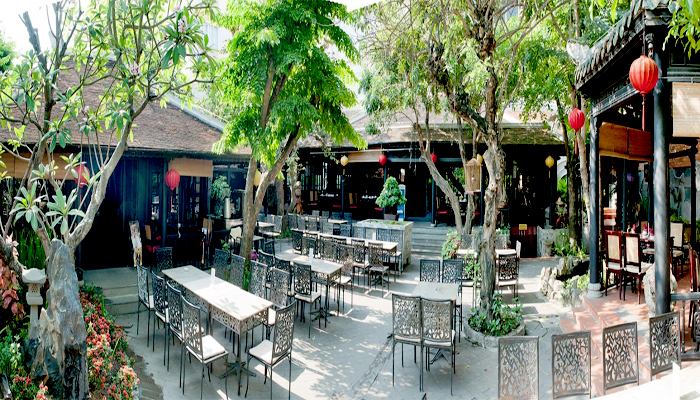 Established in 2002, Truc Lam Vien is one of the oldest café and restaurants in Da Nang City. The restaurant is located in Da Nang Center. This is the special place that has its architecture in Hue style in Da Nang City. There is the large garden around the houses with old structure, luxurious décor in Hue traditional house structure to make the perfect space. Truc Lam Vien Restaurant is not only the place for enjoying food but also the place for relaxes by the calm, fresh air and peaceful place. 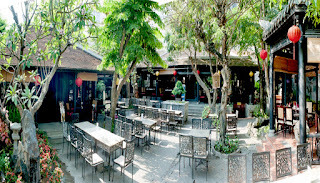 Truc Lam Vien Café and Restaurant is large with three old house areas and two areas were built in the hexagon. The parts are connected together by the wide corridor. This makes the whole space to become the unity inside the large garden. So anyone who comes here feels the calm in the warm and close space. For each size of group who come to enjoy food, the suitable tables are set up. Of course it makes the guests who feel to be pleased base on some criteria requested such as location inside the house or close with the yard or outdoor space or you come for coffee, lunch or dinner etc. Truc Lam Vien Café and Restaurant offers you the rich list of dishes in which there are simple dishes, local dishes with specialties and typical Vietnamese dishes. If you love to enjoy seafood, there are the tasty dishes from seafood to serve you. There are some delicious dishes from seafood here such as the dishes from prawn and mackerel that you should taste. Furthermore, Truc Lam Vien Café and Restaurant serves the delicious coffee which the own flavor. The price for food or type of menus in Truc Lam Vien Restaurant is in multiple levels, so it is not so difficult for you to choose. There are the daily dishes served, main menus arranged by the restaurant for guests or base on guests’ choice. Truc Lam Vien Restaurant offers the promotion or special program base on different events, so you may check with the restaurant on the time when you book your table.